Where'd You Go, Bernadette is an upcoming American mystery comedy-drama film, directed by Richard Linklater, from a screenplay by Linklater, Holly Gent, Vincent Palmo Jr., Michael H. Weber and Scott Neustadter. It is based upon the novel of the same name by Maria Semple. It stars Cate Blanchett, Billy Crudup, Kristen Wiig, Emma Nelson, James Urbaniak, Judy Greer, Troian Bellisario, Zoë Chao and Laurence Fishburne. It is scheduled to be released on August 16, 2019, by Annapurna Pictures through their United Artists Releasing joint venture. Bernadette hates people, she hates leaving the house, and more than anything, she hates the other parents at her daughter Bee's school. When she disappears, it's Bee's mission to find out where she's disappeared to and what really happened to her. Additionally, Laurence Fishburne has been cast in an undisclosed role. In January 2013, Annapurna Pictures and Color Force acquired the rights to the film adaptation of the novel, with Scott Neustadter and Michael H. Weber writing the screenplay, Semple, Bryan Unkeless, and Ted Schipper executive producing. In February 2015, Richard Linklater was announced to direct the film. In November 2015, Cate Blanchett joined the cast of the film. In April 2016, It was announced that Holly Gent Palmo and Vince Palmo had taken over writing duties on the film. In March 2017, Kristen Wiig was announced to star in the film. In May 2017, Billy Crudup joined the cast of the film. In June 2017, Judy Greer, James Urbaniak, and Laurence Fishburne joined the cast of the film. In July 2017, Troian Bellisario joined the cast of the film. Graham Reynolds will compose the film's score. In June 2018, Emma Nelson joined the cast of the film. Principal photography began on July 10, 2017. Originally scheduled for release on May 11, 2018, it was later pushed back to October 19, 2018. The date was again pushed to March 22, 2019, before once again moving to August 9, 2019. and then to August 16, 2019. ^ Galuppo, Mia (February 5, 2019). "MGM, Annapurna Team for Distribution Label United Artists Releasing". The Hollywood Reporter. Retrieved February 6, 2019. ^ Team, The Deadline (January 8, 2013). "Annapurna & Color Force Pick Up Film Rights To 'Where'd You Go, Bernadette'". Deadline Hollywood. Retrieved December 27, 2015. ^ Tatiana Siegel , Borys Kit. "Richard Linklater in Talks to Direct 'Where'd You Go, Bernadette' (Exclusive)". The Hollywood Reporter. Retrieved 14 June 2015. ^ Kit, Borys (November 12, 2015). "Cate Blanchett in Talks to Star in 'Where'd You Go, Bernadette?' Adaptation". TheHollywoodReporter.com. Retrieved December 27, 2015. ^ Lyons, Josh (April 29, 2016). "Holly Gent Palmo & Vince Palmo Re-team with Richard Linklater for "Where'd You Go Bernadette"". Tracking Board. Retrieved May 1, 2016. ^ Tartaglione, Nancy (March 23, 2017). "Kristen Wiig In Negotiations To Star In 'Where'd You Go Bernadette?'". Deadline Hollywood. Retrieved July 10, 2017. ^ Fleming Jr, Mike (May 17, 2017). "Billy Crudup Joins Cate Blanchett, Kristen Wiig In Richard Linklater's 'Where'd You Go, Bernadette'". Deadline Hollywood. Retrieved July 10, 2017. ^ N'Duka, Amanda (June 15, 2017). "Judy Greer Cast In Richard Linklater's 'Where'd You Go, Bernadette'". Deadline Hollywood. Retrieved July 10, 2017. ^ Busch, Anita (June 16, 2017). "James Urbaniak Joins 'Where'd You Go, Bernadette? '; Daniel Rashid On 'You Can Choose Your Family'". Deadline Hollywood. Retrieved July 10, 2017. ^ Sneider, Jeff (June 22, 2017). "Laurence Fishburne, Richard Linklater to Reunite for 'Where'd You Go, Bernadette'". Tracking-Board. Retrieved July 10, 2017. ^ McNary, Dave (July 13, 2017). "Troian Bellisario Joins Richard Linklater's 'Where'd You Go, Bernadette' (EXCLUSIVE)". Variety. Retrieved July 13, 2017. 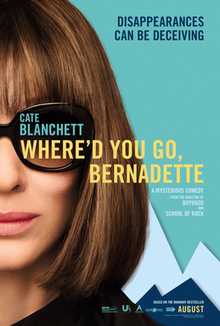 ^ "Graham Reynolds to Score Richard Linklater's Where'd You Go, Bernadette". FilmMusicReporter. September 26, 2017. Retrieved September 27, 2017. ^ Busch, Anita (June 7, 2018). "Newcomer Emma Nelson Joins As Daughter To Cate Blanchett For Richard Linklater's 'Where'd You Go Bernadette'". Deadline Hollywood. Retrieved June 7, 2018. ^ "Where'd You Go Bernadette". Directors Guild of America. Retrieved July 10, 2017. ^ Review, Tribune (June 16, 2017). "Seattle-set 'Where'd You Go, Bernadette?' to film in Pittsburgh". Triblive.com. Retrieved July 10, 2017. ^ Greiss, Leif (June 29, 2017). "Hollywood film to be shot in New Kensington this summer". triblive.com. Retrieved July 10, 2017. ^ Galuppo, Mia (July 13, 2017). "'Where'd You Go, Bernadette?' Gets a Mother's Day Release". The Hollywood Reporter. Retrieved July 13, 2017. ^ "Where'd You Go, Bernadette". Box Office Mojo. Retrieved February 6, 2018. ^ McNary, Dave (January 17, 2019). "Cate Blanchett's 'Where'd You Go, Bernadette' Moved Back to August". Variety. Retrieved January 17, 2019. ^ "Where'd You Go Bernadette". Box Office Mojo. Retrieved April 10, 2019.